Friday July 31, 2015 - Hope on the horizon at last as trials in Guinea show that a very effective vaccine against the treacherous killer disease is on the horizon. The World Health Organisation salutes the people of Guinea and all those involved in the trials that now give us all hope, the good folks we mean not those who use the outbreak as a money-making and political tool. The initial news has been heart-warming - that scientists could well be on the cusp of getting humanity a vaccine that would protect against the ravages of a treacherous and silent killer that has fed on individuals, communities and countries. At last there's hope on the horizon that the deadly Ebola Virus Disease is about to be conquered - that it would no more present such a frightening threat to humanity. The BBC's Health Editor James Gallagher writing on that organisation's many news pages states a quote from the World Health Organisation, the WHO that "Ebola vaccine is 'potential game-changer'" and goes on to state why he believes in this statement. "A vaccine against the deadly Ebola virus has led to 100% protection and could transform the way Ebola is tackled, preliminary results suggest. There were no proven drugs or vaccines against the virus at the start of the largest outbreak of Ebola in history, which began in Guinea in December 2013. The World Health Organization (WHO) said the findings, being published in the Lancet, could be a "game-changer". Experts said the results were "remarkable". This trial centred on the VSV-EBOV vaccine, which was started by the Public Health Agency of Canada and then developed by the pharmaceutical company Merck. In an analysis on that page we have this - "This could be the breakthrough the world has been waiting for. There is caution as the results are still preliminary, with more data coming in. But officials at the WHO believe the effectiveness of the vaccine will end up being between 75% and 100%. If such a vaccine was available 18 months ago then thousands of lives could have been saved. There are still other vaccines being trialled - notably from GSK and Johnson&Johnson - although as the number of cases continues to fall it is becoming increasingly difficult to prove how effective they are. The hope now is that the legacy of this unprecedented outbreak will be a vaccine that means a tragedy of this scale can never be repeated. "Results from an interim analysis of the Guinea Phase III efficacy vaccine trial show that VSV-EBOV (Merck, Sharp & Dohme) is highly effective against Ebola. The independent body of international experts - the Data and Safety Monitoring Board – that conducted the review, advised that the trial should continue. Preliminary results from analyses of these interim data are published today in the British journal The Lancet. "This is an extremely promising development," said Dr Margaret Chan, Director-General of the World Health Organization. 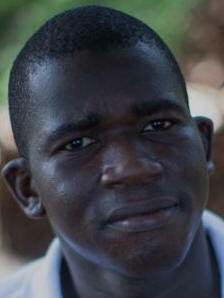 "The credit goes to the Guinean Government, the people living in the communities and our partners in this project. An effective vaccine will be another very important tool for both current and future Ebola outbreaks." While the vaccine up to now shows 100% efficacy in individuals, more conclusive evidence is needed on its capacity to protect populations through what is called “herd immunity”. To that end, the Guinean national regulatory authority and ethics review committee have approved continuation of the trial. "This is Guinea’s gift to West Africa and the world,” said Dr Sakoba Keita, Guinea's national coordinator for the Ebola response. 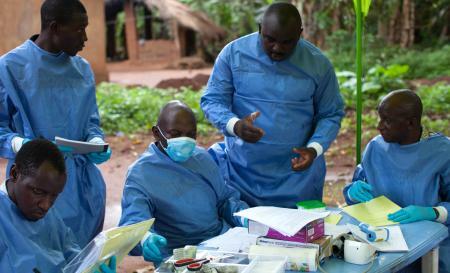 "The thousands of volunteers from Conakry and other areas of Lower Guinea, but also the many Guinean doctors, data managers and community mobilisers have contributed to finding a line of defence against a terrible disease. The 'ring' vaccination method adopted for the vaccine trial is based on the smallpox eradication strategy," said John-Arne Røttingen, Director of the Division of Infectious Disease Control at the Norwegian Institute of Public Health and Chair of the Study Steering Group. "The premise is that by vaccinating all people who have come into contact with an infected person you create a protective 'ring' and stop the virus from spreading further. This strategy has helped us to follow the dispersed epidemic in Guinea, and will provide a way to continue this as a public health intervention in trial mode." The Guinea vaccination trial began in affected communities on 23 March 2015 to evaluate the efficacy, effectiveness and safety of a single dose of the vaccine VSV-EBOV by using a ring vaccination strategy. To date, over 4 000 close contacts of almost 100 Ebola patients, including family members, neighbours, and co-workers, have voluntarily participated in the trial. The trial team includes experts from The University of Bern, the University of Florida, the London School of Hygiene and Tropical Medicine, Public Health England, the European Mobile Laboratories among others. There's joy and jubilation in many a quarter of communities affected in Guinea, Liberia and Sierra Leone where the virus killed thousands as well as countries such as the United Kingdom, Spain, Nigeria, Senegal whose nationals got infected as the battle raged against the killer disease. In Sierra Leone where sections of the press alerted the government that the deadly disease could well have entered Sierra Leone through our porous borders with Guinea, these concerned news outlets and journalists were labelled as unpatriotic, anti-government and working with the enemies of the rat and his cabal. In the meantime, funds earmarked for combating the disease were shared with reckless abandon between the rat and his cronies with dubious contracts thrown into the quagmire of ruthless corruption as highlighted by the report of the Auditor General in that report titled - "Report on the Audit of the Management of the Ebola Funds"
And when it came to the rather impossible matter of bringing the nation wreckers to justice who benefited from the mismanagement of the funds meant to fight the killer disease as well as provide succour and protection to health workers and communities afflicted, the Anti-Corruption Commission headed by someone who should know better and whose duty it is to bring to book all such persons connived, yes we say connived with the ever-compliant and rat-serving Parliament to make the extremely serious matter a "no-case submission" a la Serry Kamal. Only in Sierra Leone would you find the law making body interpreting the law contrary to its mandate. Only in Sierra Leone would you find a Parliament usurping the mandate and the Constitutional right of the Judiciary, police and the Anti Corruption Commission to rule on the findings of an audit report. Only in Sierra Leone would you have the Judiciary and Parliament feeding deep from the trough of corruption and muck brewed from the sewers of the rat passing himself off as the President of an unfortunate country still bedevilled by rapists, plunderers and thieves. Only in Sierra Leone. We were again reminded of the ravages the killer disease inflicted on Sierra Leone when going through the pages of the Sierra Leone Telegraph online news outlet - of the number of people killed - health workers including doctors and nurses - whole communities wiped out and a confused population led by a cabal whose interests lay not in helping the poor being decimated by the disease, but by how much they can make out of the misery of suffering Sierra Leoneans. Why, even the thieving so-called Information minister, the vulture himself in human form was boasting about his new "charity" called AFAKA. Just as we suspected that this was a channel for laundering funds meant for the fight against the Ebola Virus Disease, we have not heard a single whimper about this charity since the audit report was made public. And it was this same wretched thing who told the international media that the incubation period of the disease was "just 2-3 days". But back to the pages of the Sierra Leone Telegraph which had this headline - "Ebola in Sierra Leone – Remembering Dr. Khan and the other health workers" reminding us - "Since the outbreak first appeared in Guinea in May 2014, up to 510 health care workers have fallen prey to the marauding beast of a disease, leaving many more uncared for or with limited prospects, as signs of the epidemic waning begin to surface across the three most affected countries. 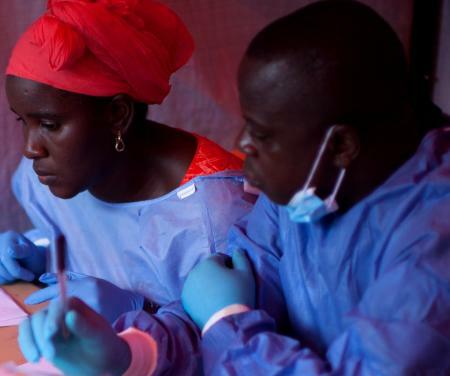 Eleven senior doctors out of Sierra Leone’s meagre pool of 120 doctors have lost their lives to Ebola. On July 29, 2014, Sierra Leone recorded the death of a local health care hero among heroes. The country experienced an irreparable loss when 39 year old Dr Sheik Umar Khan succumbed to the dreaded Ebola Virus Disease (EVD). He was the only qualified Chief Physician of the only medical unit in the world devoted exclusively to patient care and research of viral haemorrhagic fever. He has not been replaced. He can never be replaced. It was perhaps the most notable tragedy at the beginning of the crisis. One year on, Sierra Leoneans at home and across the world remember this day with grief. We grieve that the nation’s cradle of young, talented and selfless professionals like Dr Khan is crumbling on an almost daily basis. We grieve that one year after Dr Khan’s death, the remaining other health care workers continue to be stretched to their professional limits. He stayed in Kenema in Eastern Sierra Leone, to provide his care to infected patients even though he had the chance to leave his post. Like a true hero, his thirst to save and his desire to serve overshadowed any thought of leaving the country for a safer location. He was there when needed. Like Dr Khan, many other doctors and local healthcare workers in Sierra Leone embrace their own mortality and despair by blazing through the grim circumstances of their hazardous occupational context; determined to spread simple acts of love and care, without recognition or fanfare. Their dedication to patients in the absence of decent health care systems and infrastructure is remarkable, to say the least. Collectively, as Sierra Leonean citizens and global citizens of the world, let us work together to put Ebola to shame by empowering our health care workers with love, care and resources to continue the fight against the ongoing impact of the dreaded Ebola disease. Let us accept them into communities and not reject them because of the stigma of Ebola. Let us demand for better training and capacity support to enable them to deliver better healthcare in the future. Let us pay those medical college fees. Let us volunteer our time or resources where possible. Let us offer burial workers and community workers jobs so they can continue to support their families, beyond Ebola." It is interesting, if not sickening to see Parliament springing to the defence of wrong-doing, criminal activity and outright thieving as revealed in the report of the Auditor General. It must be recalled that this is not the first report by the Auditor General in which wrong-doing had been highlighted for the various law enforcement officials to act upon. The website of the Auditor General has a number of reports on how government resources were being plundered. The latest audit report of 2013 showed how State House and our missions overseas had been engaged in thieving and outright chicanery. Year after year the Auditor General's report has been highlighting the pathetic state of the health delivery system pointing directions as to who should be taken before the courts. What caused Parliament to overlook these reports and come charging like a maddened bull could only best be imagined. The Parliamentarians have yet to account for the millions dished out to them in the fight against the deadly Ebola Virus Disease. Yearning for the mother country?